If you're participating in a production of A Christmas Carol or attending a Victorian-themed holiday party, you have plenty of options for Dickens Christmas costumes. You can buy or make period outfits for men, women, and children, as well as emulate the costumes of the beloved characters that populate the stories of Charles Dickens. Charles Dickens' beloved classic provides plenty of inspiration for costumes. There are lots of options for purchasing these outfits, and you can also assemble them yourself. Children's Ebenezer Scrooge Costume - This outfit from Heritage Costumes comes in children's sizes small through extra, extra large. It includes a frock coat, vest and dickie, tie, pants, and top hat and retails for about $90. Striped Scrooge Costume - This nightshirt and cap from WonderCostumes.com is made of a blue and white striped fabric. It's one-size-fits-all for adults and retails for about $26. 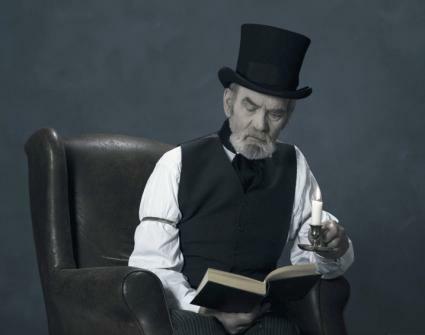 You can also make your own Scrooge costume by wearing a thrift store nightshirt or oversized men's shirt and an old pair of wire-rimmed glasses. Use gray hairspray to give yourself stringy gray locks and use makeup to create wrinkles. Add a cane and a grumpy expression, and you're all set. Tiny Tim costumes are not generally available online, but that shouldn't stop you from dressing up as this important character. You can assemble a Tiny Tim costume easily from a few pre-made items. 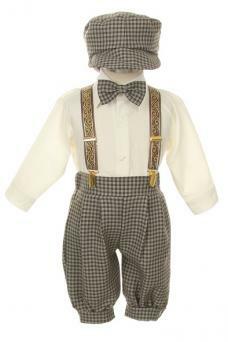 As the basis for your costume, you'll need a Victorian-style boy's outfit, such as those available from Dapper Lads. Alternatively, you can purchase these items individually from a thrift store. You can shorten full-length pants to make knickers by cutting them off about three inches below the knee and sewing a channel for some elastic. No matter what type of outfit you select, give it a worn look. You'll also need to add a single crutch and possibly a worn-looking winter scarf. Again, buying an official costume for the Ghost of Christmas Past is a bit of a challenge. However, this is an easy one to assemble yourself. The look is open to interpretation, but many people think of this ghost wearing long white robes and sometimes, a wreath of flowers. The ghost can be male or female, so this is a great option for anyone. 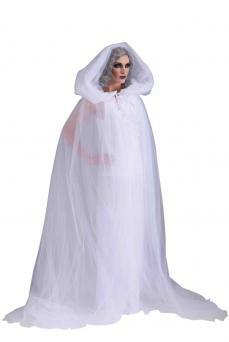 Pick up a white nightgown and sheer white robe from the thrift store to form the main part of the costume. Add a wreath of artificial flowers if you desire. Paint your face to be very pale and consider adding a bit of sparkle for that magical look. Carry a LED candle, such as those available from CoolGlow. In most representations of A Christmas Carol, the Ghost of Christmas Present is depicted as a jolly man with a brown or red shaggy beard and a long green coat or cloak. Since there aren't costumes available for purchase, you can assemble one out of items you can buy online and in stores. Start with a beard, such as the Viking Beard from PartyCity. 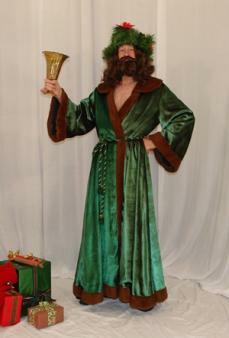 Add a long green cloak, such as the Green Black Velvet Cloak from Amazon.com. Consider adding a wreath of holly for your hair, available at you craft store, as well as a white fur wrap. You can buy white faux fur by the yard at your craft store to make a scarf or wrap. Once again, you can't buy a costume that's sold specifically for this purpose. However, the Ghost of Christmas future almost always looks a lot like the Grim Reaper, which is an easy costume to buy. Child's Grim Reaper Costume - This costume from Halloween in Style incudes a grim reaper robe, hood, and gloves. It fits kids sized medium through extra-large and retails for about $25. 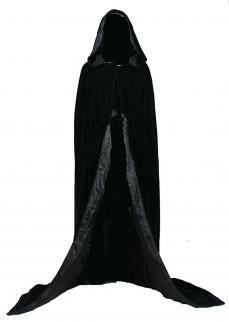 Grey Reaper Adult Costume - This classic choice fits most adults and includes a long dark grey cloak and hood. It is sold by Spirit Halloween and retails for about $30. Deluxe Velvet and Satin Cape - For a more feminine take on the Ghost of Christmas Future, choose a pretty cape like this one from PureCostumes.com. It fits most adults and retails for $36. You can also make your own Ghost of Christmas Future costume by cutting a semi-circle of black fabric, cutting a hole for your neck, and attaching ties at the neck. You can leave the edges raw for a creepier look. Add a black hood, and paint your face black too. Dickens' novels take place throughout the 19th century, but most of the Christmas stories, including A Christmas Carol, were written in the 1840s. There are lots of great Victorian costumes you can make or buy. To keep the Christmas theme, choose winter fabrics like velvet and wool and Christmas colors, such as red, green, royal blue, and other jewel tones. There's nothing quite like the classic charm of A Christmas Carol, and you can channel the characters and times of Charles Dickens with costumes that are perfect for the era or the story. There are plenty of great options out there, so take your time choosing one that will be perfect for your needs.